Caring for your parking lot or garage is a huge component of building maintenance. As mentioned in a previous post, it influences the first impression your customer has when they arrive at your facility. At Wahlen, we have over 40 years of experience keeping parking lots and garages in tip top shape and recommend the following schedule. The first step to keeping a lot or garage clean is to ensure the pavement is kept free of debris. Whether you manage a lot or garage, we recommend you have your pavement swept as often as you feel the need to. If you manage a lot, we definitely recommend doing a sweep after the leaves have fallen in the fall, before the first snowfall, and after winter once the snow has melted. While we love the changing colors of fall, once fallen leaves begin to deteriorate they can make your lot appear dirty. Similarly, a sweep and clean before winter can help ensure fallen snow doesn’t get dirty from what’s beneath it. Once the final snow melts, hidden debris may be revealed, so it’s another great time to call Wahlen and get your lot ready for summer. 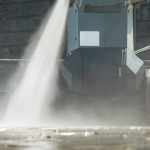 We recommend pressure washing twice a year for more than just aesthetic reasons. 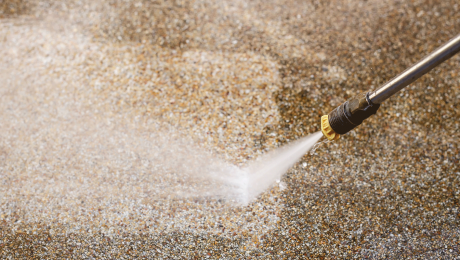 A proper pressure washing will help preserve the concrete surface by removing contaminants such as oil, beverage spills, and most import, salt. If left to sit on a concrete surface, salt can penetrate the concrete, resulting in pitted surfaces and rusted rebar. When the steel rebar begins to corrode, the structural integrity of the concrete becomes compromised , resulting in cracked, uneven surfaces, and weakened concrete. Pressure washing on a regular basis can delay this process for years, preserving the investment that you’ve made in the concrete surface. 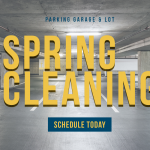 In addition to keeping your lot or garage clean, it’s your responsibility to keep it safe for the drivers who will be parking in it. Ensuring you have clear and vibrant striping helps prevent confusion and keep drivers as well as pedestrians safe. Clear identification of handicapped parking stalls are also necessary requirements of the American with Disabilities Act. 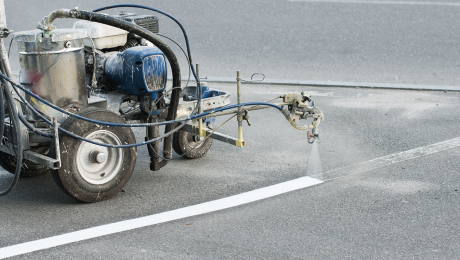 Not only does proper striping keep folks safe, it adds to the overall appearance of your building. In addition to cleaning and striping, a well-maintained concrete lot or parking garage is sealed every 3-5 years. Concrete sealing is another measure of protection to help ensure your investment lasts as long as possible. Keeping up with your parking lot or garage maintenance schedule can be a lot of work, but that’s where Wahlen comes in. Wahlen Works offers sweeping, pressure washing, striping, and sealing services and we take on coordinating these efforts so you don’t have to. Contact us today to learn what we can do for you. When a customer approaches your business, their first stop is often your parking lot or garage and the outside structure of your building. Like it or not, appearances matter. When public and private spaces aren’t clean, visitors can get the impression that a place is neglected. Seeing that the outside of a business is neglected may give visitors the impression that the owner neglects other aspects of their business as well. A neglected space can even be interpreted as an unsafe space, and this isn’t a completely baseless assumption by visitors. A recent study done in England found that poor levels of cleanliness are often associated with increases in other low-level crime and social disorder. As a business owner, you don’t want these subconscious thoughts to run through the minds of your customers. At Wahlen Works, we specialize in helping businesses give the best first impression to their customers. From the moment that a customer drives into your parking lot or structure, they should be able to easily determine where to park. 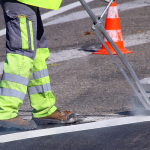 Keeping up on your pavement marking and parking lot striping can help reduce the tiny amount of stress drivers may feel when looking for a parking spot. When customers step out of their car, you want to ensure that they’re not stepping on dirty or stained pavement. Again uncleanliness can be associated with neglect in the consumer’s mind. So you want to show that you take care of your business, like you’ll take care of whatever need they may have. 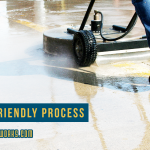 Regularly pressure washing your parking facility is one small way to show that you care. Lastly, maintenance is everything. 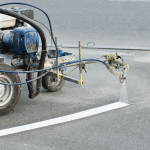 If you have a concrete structure or concrete pavement, concrete sealing is one way to help ensure the pavement lasts and your pressure washing jobs last longer, as a quality sealant can help prevent staining. When you own a business, it’s important to think about think about the customer’s experience from the moment they pull up to the moment they leave. If you need help making sure that first impression is a great one, contact us today!